I have been a smoothie lover for a long time. My smoothie love started with Angel Food Cake at Smoothie King in New Orleans, when I was in college (don’t judge, it was better than froyo). It was a strawberry, banana mixture with a little vanilla. I’m not really sure how it resembled angel food cake… I’ve always loved frozen drinks. In middle school, my lunch of choice was a Mint Chip Shake (don’t judge) as the sandwiches grossed me out. In high school, my parent’s weird friend took me for Kahlua milkshakes, when we visited him and his wife in St Thomas, ok you can now judge. Anyway, I still love smoothies. It’s like mixology for the morning. Our newsletter today, explained the dos and don’ts of smoothie making. If you haven’t, and I’m not sure why you haven’t, have a look. We shared our Mermaid Majik recipe there. 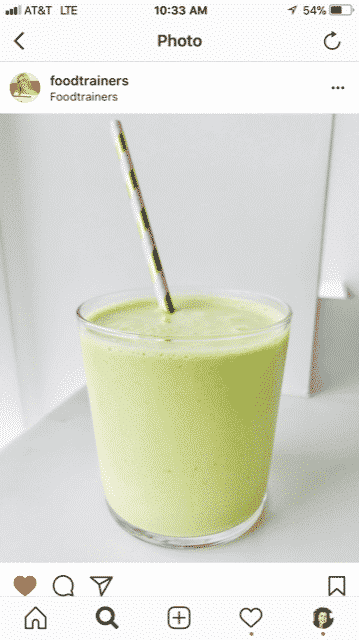 And for a bonus recipe here’s our Stash Smoothie. Add unsweetened nut milk to the blender first, follow with other ingredients. Blend until creamy and combined. Pour into mason jar (for transporting it) or large glass, snap photo, post it and tag @Foodtrainers on social.